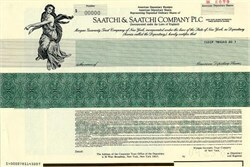 Beautiful engraved specimen certificate from the Saatchi & Saatchi Company dated in 1988. This historic document was printed by United States Banknote Company and has an ornate border around it with a vignette of an allegorical woman . This item has the printed signatures of the Company's President and Secretary and is over 19 years old. Saatchi & Saatchi is an advertising agency founded by brothers Maurice (now Lord Saatchi) and art collector Charles, both born in Baghdad, Iraq, to Jewish parents. They are most famous for their campaign on behalf of the Conservative Party before the 1979 UK general election and for the adverts for British Airways and other state-owned interests privatised by the Conservatives in the 1980s. After working for other advertising firms, the two brothers established their own company in 1976. With the support of American investors, Saatchi & Saatchi pursued a policy of buying out competing firms with lucrative established contracts. In 1995, a boardroom coup saw the brothers leave the company and set up a new firm M&C Saatchi. Saatchi & Saatchi's holding company is Publicis in 2001. Saatchi's worldwide CEO is Kevin Roberts. Saatchi & Saatchi has offices in over 80 countries around the world. Its worldwide headquarters are in New York City. Its other main office in the United States is located in Torrance, California. In the US, Saatchi's largest clients are Toyota, Procter & Gamble and General Mills. The London office, the home of the original agency, is on Charlotte Street and has its own pub, named "The Pregnant Man" after the firm's first famous ad. 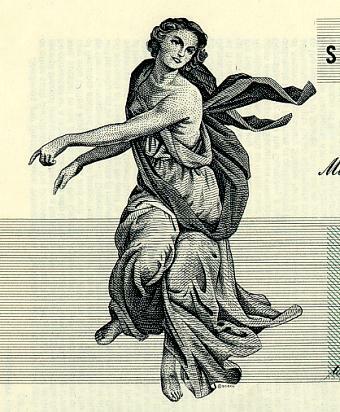 London is often the base for many of Saatchi's pan-European accounts, which include Toshiba, Sony Ericsson, and VISA. Saatchi & Saatchi entered a new phase in 1997 when it officially dropped "advertising" from the name. Under the direction of its new CEO, Kevin Roberts, the agency sought to be known as an "ideas company". This gave rise to the Lovemarks philosophy�a theory that is premised on the concept that 'brands are dead'. Lovemarks has been the driving force for many of Saatchi's global clients, which include over 50 of Brandweek's Top 100 Brands in Advertising. Across its 189 offices, Saatchi & Saatchi works with the likes of VISA, Sony, Lexus, Guinness, Hewlett-Packard and others to promote the Lovemarks philosophy.